bio.be is the Belgian federation of companies active in life sciences and biotechnologies. It is part of essenscia, the Belgian federation for chemistry and life sciences industries. In its advocacy role, bio.be/essenscia represents the interests of its members as regards to legislation and standards at various policy levels (Belgium, EU, OECD). In its communication role, the federation promotes the excellence of its members to deliver innovative products, services and technologies for a better life for today and for the future. the capability of this sector to answer major societal challenges. bio.be/essenscia can rely on synergies within the essenscia group, including with the regional branches essenscia wallonia, essenscia brussels and essenscia vlaanderen as well as with the products’ sectors such as Pharma.be. It has also access to the expertise of its extensive network of partners. bio.be/essenscia is, for example, the Belgian national association contact point for EuropaBio, the European association for bioindustries, and is also member of ICBA, the International Council of Biotechnology Associations jointly created by BIO and EuropaBio. 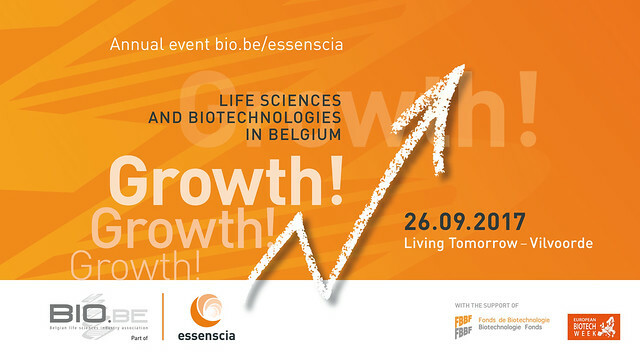 bio.be essenscia and Agoria join forces to accelerate the digitalization of biotechnology companies in Belgium. Yes, Life sciences and biotech companies are at the top in Belgium. Yes, they are innovative and they find capital and investors. But it does not come from a magic wand ! What are the challenges biotech companies face in their scale-up process? Find it out at our event “Scale up! It’s time to grow for biotech companies”. The scale-up phase is a challenging time for Biotech and Life Sciences spin-offs and start-ups. On their ways to become a company as such, they already passed different crash-tests successfully in their early development phase such as technology assessment with key partners, effectiveness of the business model, growing sales, confidence of investors, etc. It is now time to grow and to create economic and social added values. Click here to discover the pictures!